Take large bowl and mix all the ingredients. The batter should be thick. 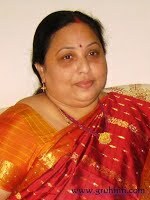 You can see in the pic. 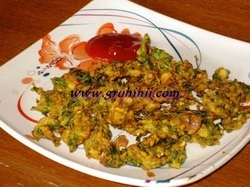 Heat oil in a pan and drop the batter with your fingers like small pakoras in the oil and fry until golden color. Remove from the oil and drain. 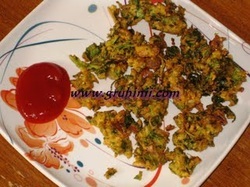 Thotakoora pakodi/Chauli baaji ke pakode are ready.Serve hot with tomato sauce or any chutney. 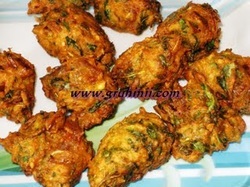 Tip :You can also make Kadi with these pakoras. Add little water to the batter and it make smooth. 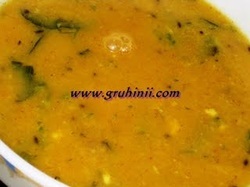 Drop the batter with a spoon in the oil in the shape of bajjiye as shown in the pic. below. 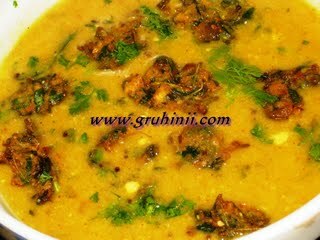 Heat a table spoon of oil in a pan, add rai to it when rai stars spluttering add jeera, Hing and urad dal. Stir for few sec. and add chopped onions and curry leaves. 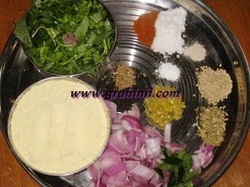 Fry until the onions turn pink, add 2 tea spoons of chilli-ginger paste stir, add haldi, dhaniya powder and chilli powder. Mix well and add the curd to it. Add salt and sugar, boil for 5 to 8 mins in a medium flame. 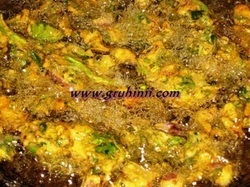 Now add the Pakoras to the Kadi and boil for few seconds. 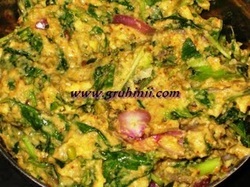 Take it into a serving bowl and garnish with fresh coriander leaves and serve with rice or rotis. Try Once.